Repentance is one of those big biblical words sometimes lost in the worship of God. Yet, without repentance we would not be Christians and we would not be able to live fruitful lives following Jesus. To repent of something simply means to change our minds and stop doing one thing, and start doing another. In Holy Scripture, repentance means to stop sinning and start worshiping God. Since true worship is a conversation with God in which we hear his revelation to us and we respond to him, repentance is a vital part of the Christian worship experience. The nitty-gritty of repentance is to change our minds about trusting in things and people other than God, and start placing our complete faith in Christ alone. The prophet Isaiah saw a vision of God in the temple, a self-revealing of the One true God that caused him to be completely unraveled with repentance (Isaiah 6:1-7). Isaiah was reduced to nothing after seeing a vision of a holy God. Humans cannot see God in his glory without seeing their sinful selves. Isaiah’s response to God was not praise, but confession. Show me a proud, self-centered, and arrogant person and I will show you a person who has not seen God (and will not see God unless recognition of personal sin is realized). Isaiah could not cleanse himself from his sin; he needed God to purge and purify him from his uncleanness. In the same way, we need God to cleanse us. The New Testament says that “The blood of Jesus, his Son, purifies us from all sin… If we confess our sins, he is faithful and just and will forgive us our sins and purify us from all unrighteousness” (1 John 1:7, 9). In the Bible, when people saw God they were completely undone and saw their own sin and depravity for what it is. When the Apostle Peter saw the Lord Jesus in his immensity and power through a miraculous catch of fish “he fell at Jesus’ knees and said, ‘Go away from me, Lord; I am a sinful man’” (Luke 5:8). When the Apostle John had a vision of Jesus Christ in all his glory, and heard his voice, he fell at the Lord’s feet as though dead (Revelation 1:12-17). When the prophet Ezekiel had a vision of God and saw the appearance of God’s glory, he fell facedown (Ezekiel 1:25-28). Even Daniel, perhaps the most righteous prophet of all time, saw a vision of God in all his glory and fell prostrate with his face to the ground, totally overwhelmed with God’s holiness and human sinfulness (Daniel 8:15-18). There is so much sinfulness in the world and so much indifference in Christ’s Church today because people are not seeing God in his glory and his holiness. If they did, they would be completely beside themselves and see sin’s foulness and degradation and repent from all the ways in which they have been apathetic and complacent in living their lives. The world and the church need a fresh view of a holy God that only comes from meeting with God. We need to put ourselves in a position to see and hear God so that we can turn from all the obstacles that prevents us from experiencing Father, Son, and Spirit. What hinders us from seeing God’s glory and hearing God’s voice is legion: inattention to God’s Word and God’s creation that would cause a mindfulness to the Holy Spirit; intense, constant, and prolonged preoccupations and daydreams that prevents availability to the words and ways of Jesus; lack of sleep and good health habits that dulls the spiritual senses and prevents awareness of God; lack of spiritual practices and disciplines that would put us in a position to experience a vision of God. To put it bluntly: we must repent of all the ways we do not pay attention to God. God is calling but we do not hear him. God is revealing himself but we do not see him. Ø What, then, are we doing in our personal lives to put ourselves in a position to see and hear God? Ø In what ways are we corporately fostering a sense of the holy God? 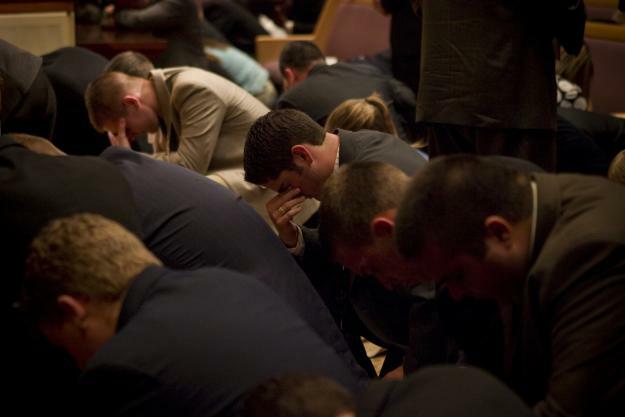 Ø How does repentance fit into to our personal and corporate worship? Ø Have we identified the things that grieve the heart of God so that we can repent of those things? Ø What one action step will you take in response to this blog post? We serve a blessed holy triune God of Father, Son, and Spirit. God has gone far out of his way to reach us so that we can participate in the dance of the Trinity. May we all see a vision of God is his glory this Sunday and allow that scene to slay us so that we will have renewed fellowship with God in Christ through the power of the Spirit. Amen.